White balsamic vinegar. What is it? Where does it come from? What is the difference? White balsamic vinegar is not a traditional balsamic, but it is similar in flavor and use. Traditional and commercial balsamic vinegar is made by taking ripe grapes which are crushed into what is called a “must”, a combination of juice and skins. This must is then cooked at temperatures usually over 100 degrees Celsius. This cooking process concentrates the must and imparts much of the color that exists in traditional balsamic vinegar. After cooking the must is aged for a period of time depending on the quality of balsamic being made. Aging can range from as little as one month to 50 years. This is one reason for the wide variety of qualities and pricing. Depending on the quality, the must is mixed with Red Wine vinegar and sometimes caramel is added for additional coloring. The process is a bit different when making a white balsamic vinegar. It starts the same with a crushed grape must being created, but instead of cooking the must with a high temperature, it is instead pressure cooked at a lower temperature. This prevents the must from caramelizing and keeps the coloring light. Aging times also vary from producer to producer, however they rarely exceed one year for a white balsamic vinegar. Sometimes it is aged in stainless steel barrels instead of the traditional wood barrel. It is then mixed with white wine vinegar instead of red wine vinegar and no caramel coloring is added. The resulting product has a clear color and a lighter, brighter flavor. The primary reason to choose a white balsamic over a regular is that the red color may create an undesirable appearance in the food you are preparing. The white variety is also popular when making salad dressings as it is usually not as sweet and has a milder flavor than regular balsamic vinegar. It can also be used in sauces for meat, chicken or fish or to deglaze a pan. When you are looking for the perfect balsamic for drizzling over cheeses, fruits, or dipping with olive oil most will prefer a traditional balsamic vinegar to a white. Make sure to try a variety of white balsamic vinegars to see which one is your favorite. Give a white a try in some of your favorite recipes for a new twist. 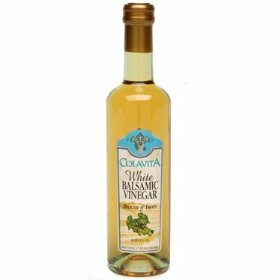 Colavita White Balsamic Vinigar…turns a regular salad into a dish you’d rather eat than the main course. Delicious – glad I found it. Thanks Charlie!!!! Actually not at all:). It’s a very simple flvaor. Subtly sweet from the sugar with a butteriness, and a tang from the vinegar. Since it only cooks for less than an hour, there is not too much acidity from the vinegar like you would get from a saur kraut, or pickled product. You should try it. Maybe do a half batch in case you don’t like it.